It started when Ben Whitlock asked me if I would like go to the Tour Down Under. My first anwser was hell yeah. 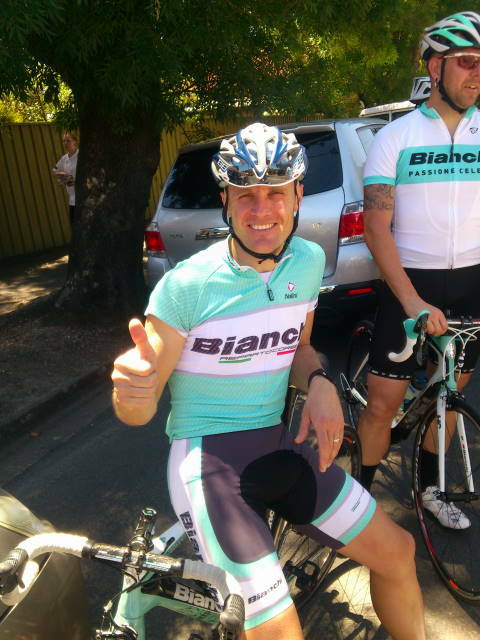 Sunday 20th of January 1.00pm I arrived at the Bianchi tent in awe of the line of bikes and staff. Meetimg Freddy Morini ex pro ride was a high light he was so down to earth. Annalisa is 2nd in charge of international sales for the Bianchi Organisation, quite a fete for a lady of only 33. Great history behind this behind this beautiful ladies employment, starting with an 18 day contract sweeping floors and tidying the factory at the tender age of 19, she has worked her way through all departments to her current position. She now jet sets around the world, not even having time at home with her cat who now lives full time with Annalisa's mum. After a time I decided to investigate the rest of the tour village and come across the Trek tent. 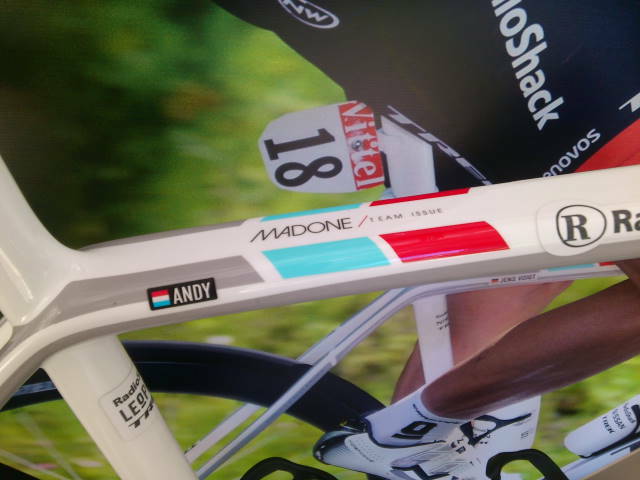 I spied Andy Schlek's Series 7 Madone Team Issue. Decided to try my legs at the Uni SA Fitness Test which is a 30 second sprint on a stationery spin bike measuring maximum sustained wattage. After several failed attempts due to bike failure I recorded 985 watts for 30 seconds which equals 16.9 watts per kilo. The record for the day was 1069 and 13.8 watts per kilo. No mean fete for a big guy!! Started at 9am with a bike fitting and Bianchi riding kit (white not my most flattering colour) but hey it was free. 10am arrived and all 30 of us eagerly awaited the Pro Team Vacansoleil-dcm for our ride to Outer Harbour with Team Car following close behind. After a couple of mechanical issues (me not wanting to overtighten seat clamp bolt), Ben and I lost the group!! After 40 minutes in the wrong direction Ben's phone sounded and suggested we head south to find the Vacansoleil team cooly indulging in coffee at Glenelg. Not Outer Harbor and in big trouble. After a short stay and a lot of excitement from by standers (approximately $150,000 worth of bikes leant against the coffee shop wall all unlocked), we headed to Henley Beach and back to the City for lunch. Osteria De Mesa - this Italian Restaurant was the venue for lunch. The food, beer and wine was flowing very fast and abundantly (no team riders drank beer due to the high carb and calorie count). Lunch went from 1pm to around 5pm I then retired due to exhaustion and over eating. My compliments to the chef!!! Started with breakfast at the Hilton at 7am followed by a class on the Bianchi history. Did you know Eddardo Bianchi was the first man to use the chain to drive a bicycle. To our suprise at 9.30am Ben Whitlock said to be back at 10 to get on your bike and ride to Lobethal to watch the stage finish at the Lobethal Bierhaus. Trying to keep up with Fast Freddy combined with a big lunch and some beer equaled a sleepy finish back home on the bus. Day 3 ended at Sangria Bar on Grote Street and what a feast. The last photo I just could not resist that I simply call it I love you MUM. About this time Freddy got a call from the the Vacansoleil team in need of some help. I put my hand up as fast as I could. Day four began with me picking up two members of the Vacansoleil team and drive them to Mt Barker for the start of the race. Opportunity of a life time to help a PRO Tour Team set up for race day. I helped the team Mechanic unload the and check over bikes. Wow little old me helps out a PRO Tour Team. 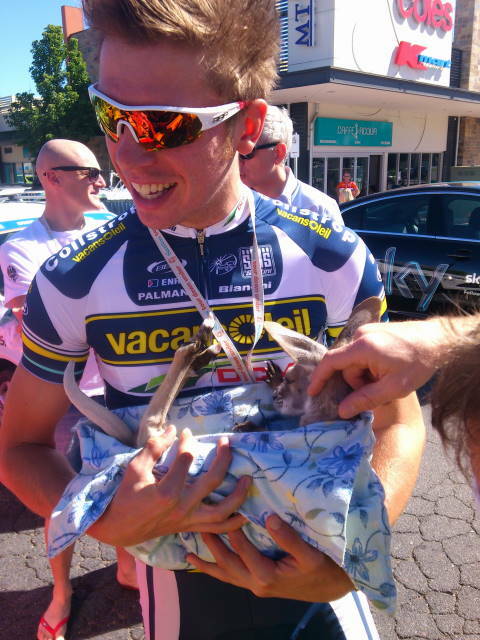 Here is me Boy Van Poppel (who finished fourth on day one) and Boy with Andy Shleck (the kangaroo). This saddly brings my time with Vacansoleil team and Bianchi Australia to an end it was one of the best weeks I have had away from my family. Thank you Bianchi you guys rocked my world. Finished my week off with the bupa tour down under with a 140khm ride which I did in 5hrs and 9 minutes!! !